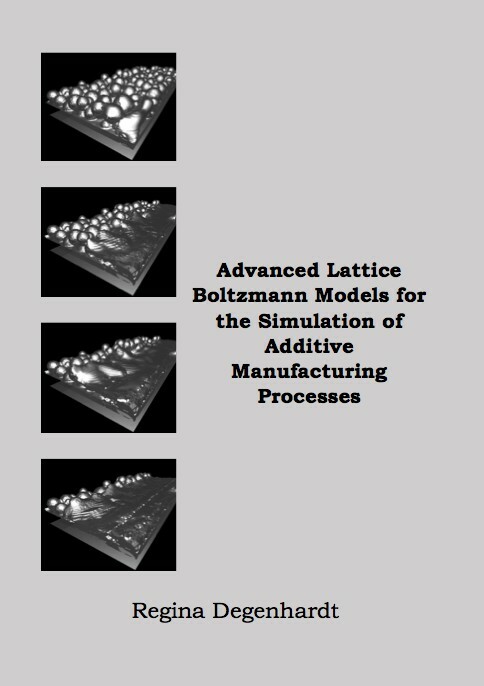 This thesis presents the three-dimensional modeling, discretization, implementation, and simulation of additive manufacturing processes on the example of electron beam melting (EBM). The applied numerical scheme is a thermal multi-distribution lattice Boltzmann method (LBM) allowing an efficient parallel implementation. The liquid phase of the melting pool and the gas phase of the atmosphere are separated by the free surface lattice Boltzmann method (FSLBM) that does not compute the dynamics of the gas phase explicitly but sets a boundary condition at the interface. Furthermore, the electron beam gun and the metal powder particles are explicitly modeled. A realistic particle size distribution is achieved by using an inverse Gaussian distribution. waLBerla. Both frameworks work on state-of-the-art supercomputers. The EBM application and its implementation are validated by benchmarks where analytical solutions are common knowledge. Moreover, the simulation results are compared to experimental data with respect to quality of the product in order to avoid porosity, and ensure dimensional accuracy. Since the numerical and experimental data are highly concordant the implemented EBM model is suitable to develop new processing strategies in order to improve the quality of the products. The simulations support machine users and developers in order to find an optimal parameter set for specific parts.